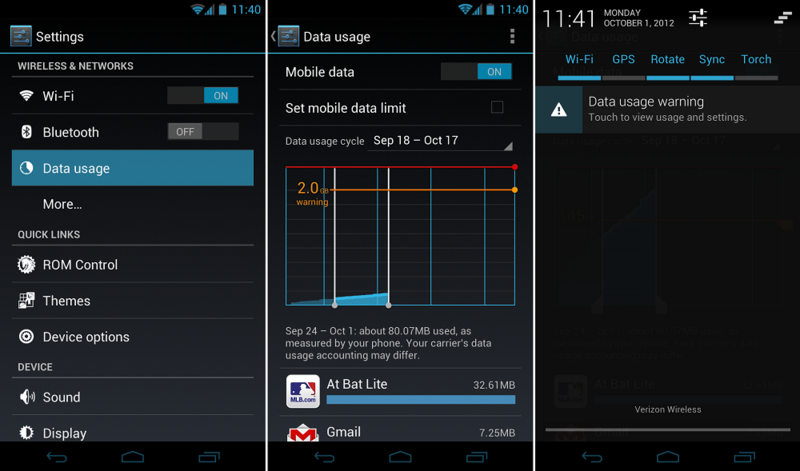 With the introduction of Ice Cream Sandwich and Jelly Bean, Google has enabled Android devices to notify their owners that the device has reached a set data limit. You as the owner can set this limit anywhere from 0.0MB all the way to whatever your plan is set at. If you’re unlimited, then this feature is probably something you won’t be using anytime soon. Below we have written out the directions for setting a data limit. These limits can be used as just a warning or as a way for the device to automatically restrict data usage to make sure you don’t go over your carrier’s plan. Additionally, users can set time cycles for the data count to reset, which should usually be set on your billing cycle. If you’re a heavy user, then this feature could save you later down the road. If you would like to enable a data limit, check the box for “Set mobile data limit.” Once the limit is reached, the device will disable your mobile connection. 4. Using the horizontal orange line, set the limit at which you want the device to disable data. 5. Using the two vertical white lines, set the range of time you would like calculated. 6. Once your mobile data reaches this number, it will notify you in the notification area and disable data. Hopefully this can save some of you data hogs from going over your limits. Happy streaming!